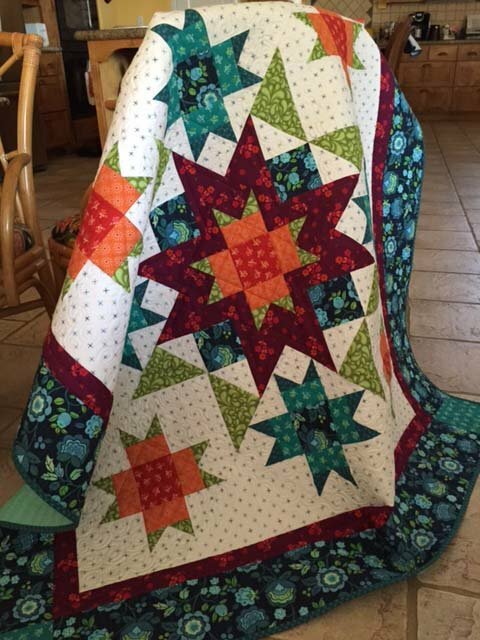 More Than Stars BOM Quilt - Short Program - Includes Backing! Programs - Most Include Backing! 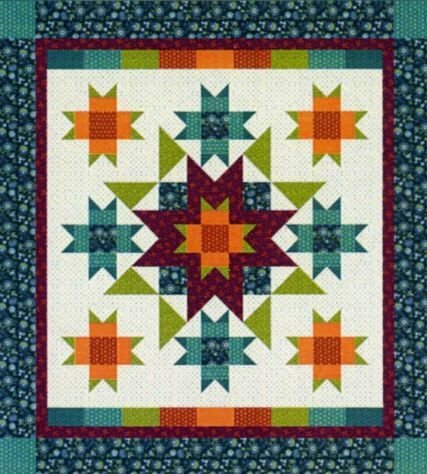 > More Than Stars BOM Quilt - Short Program - Includes Backing! To order the Complete Kit (including backing!) for only $299.94, select the Complete Kit option in the Dropdown box above. Finished Sizes - You can make any of the following sizes with your kit! For 93” x 101” quilt, there will be a Top & Bottom Rectangle Border and 8 1/2” Outer Borders. For the 101” x 101” quilt, there will be Rectangle Borders on all sides and 8 1/2” Outer Borders. For the 105” x 105” quilt, there will be Rectangle Borders on all sides and 10 1/2” Outer Borders. More than Stars is a six month program. You'll have this beautiful quilt made in no time! Complete Kit (including backing!) only $ 359.94! This quilt features fabric designs by Nancy Rink for Marcus Fabrics! 1) The original background was an Intrigue fabric that is no longer available. We consulted with Nancy Rink and chose the Marcus Marshmallow solid for the background. 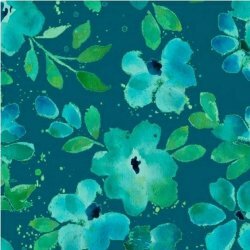 2) Several of the original teal fabrics are no longer available. We have substituted two teals from Nancy's new Seaglass collection (the top two teals in the fabric diagram above). 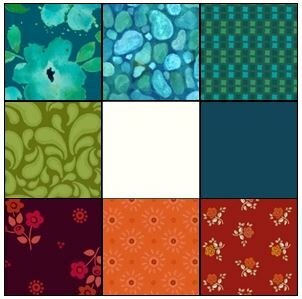 3) All the wine, red, orange and green use the original Marcus Intrigue fabrics. We include enough of the beautiful border fabric for you to cut Length-of-Fabric (LOF) strips. No seams! Starts in June, 2018 (or anytime after that you would like to start). Part 1 - Order Online. Choose the colorway of your choice and order the reservation fee online. Please note that your payment details are encrypted and we cannot see your credit card information. Orders will come in as “Pending” and we will then process your payment, generally within 24 hours. Your reservation pays for your final kit. Part 2 - Call us at 785-243-4044. We need to confirm your shipping address, phone, and email address. We'll also need your credit (or debit) card details for your monthly billing. Like all our Flexible BOM programs, we will cut complete kits in advance, so you can take as many blocks as you want at one time. Our programs also include ample fabric and our famous cutting diagrams so you can SEE how you are supposed to cut the fabric! Coordinating backing is included with this program. * Coordinating Backing - We provide an extra 6" all the way around - You will receive 9 3/4 Yards in three equal pieces of 3 1/4 Yards to make it easier to work with. * Complete Kit, including backing $ 359.94! Your program includes 9 3/4 Yards of Coordinating Nancy Rink backing, cut into three equal pieces of 3 1/4 yards to make it easier to work with.